Saw this listing this morning. Pretty darn rare. 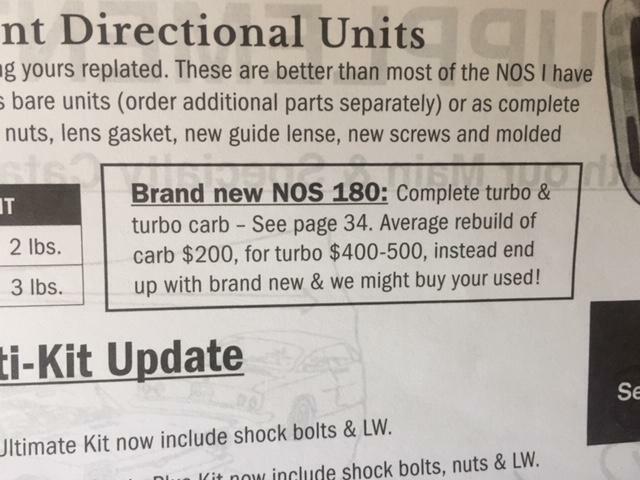 buy a used core, and have it rebuilt, and you are probably close to the price of the NOS unit. This is the second one that I have seen offered for sale this month, and both were priced similarly. I think it's worth $1100 just b/c it's a rare NOS piece, but after 50+ years on the shelf I would want to rebuild it anyhow before using it...so then it's really no different from any nice rebuilt TC. The band clamp looks different than mine or any other 180 setup I've seen, but then I guess maybe I haven't seen them all.